The European Week of Astronomy and Space Science (EWASS) was held June 26-30 in Prague and attended by over 1,100 people, and the ASCL was there! This post is an overview of the ASCL’s participation in the event; a subsequent post (or two) will provide more detailed information and links to slide decks for sessions the ASCL was involved in organizing. This was my first time attending EWASS, which was initially brought to my attention by Keith Smith (Science). It was also my first time in Prague. My activities since the meeting have included submitting proposals (with others) for EWASS 2018, which will be in Liverpool, and pricing short-term apartment rentals in Prague; clearly, I liked both the meeting and the city very much! My thanks to Keith for cluing me in to this fine meeting. 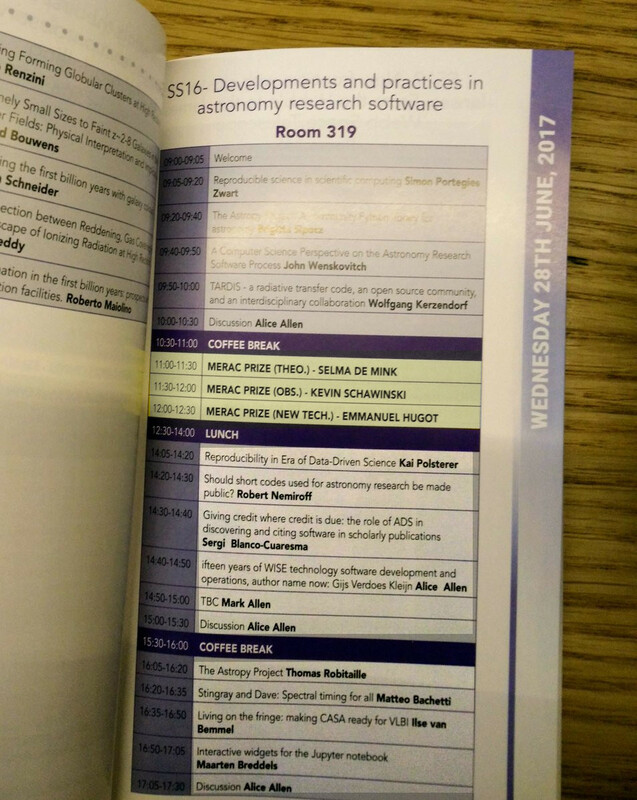 ASCL Advisory Committee member Rein Warmels (ESO) and I partnered with Abigail Stevens (U Amsterdam), Amruta Jaodand (ASTRON), and Matteo Bachetti (INAF-Osservatorio Astronomico di Cagliari) on software-related sessions for EWASS 2017; our collaboration resulted in a day of talks on Wednesday called Developments and Practices in Astronomy Research Software and a Hack Together Day on Thursday, this latter coordinated by Stevens, Jaodand, and Bachetti. The ASCL was well represented, with ASCL co-founder Robert Nemiroff (MTU) giving a talk on short codes and Warmels and I each moderating 90-minute sessions on software, both with a discussion period; I also gave a presentation on the ASCL and participated in the Hack Together Day. The Hack Together Day had numerous exciting projects; the ASCL’s projects were less glamorous than most others but yielded really useful information, some of which has already been added to ASCL entries. Our collective efforts went very well, despite a few worrisome moments along the way. The room our Special Session presentations were in had 98 seats; perhaps 90% were filled for these sessions, and there were people also standing in the room. The presenters/presentations were great and the discussions were lively, and more information about these sessions will be posted soon. 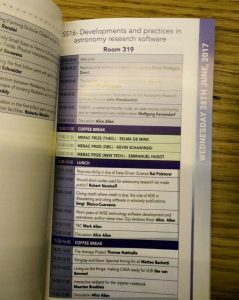 There was of course much much more to EWASS than our efforts; notable for those software-inclined were the astrometry, big data, and astroinformatics sessions and associated posters for all of these sessions. In all, an excellent conference! This entry was posted in conferences, EWASS, news, poster, presentations, special sessions on July 23, 2017 by Alice Allen. Page rendered in 0.442 seconds. Blog powered by WordPress.